Our products are made-to-order. We deliver your products in our own workshop. Address: unit no.22, Baghe Bank St., Shahid Basiri alley, Gholhak crossroads, Shariati St., Tehran, Iran. 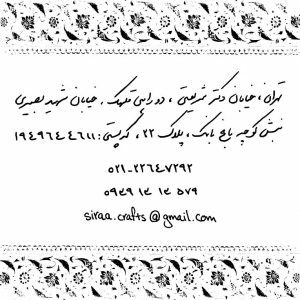 Address: 1st and 2nd floor, no.63, between intersections Jahan Koodak and North Gandhi, Shahid Haghani highway, Tehran, Iran.